The city of St. Petersburg has one four-man crew to keep up with repainting, and re-striping the roadways across the entire city. 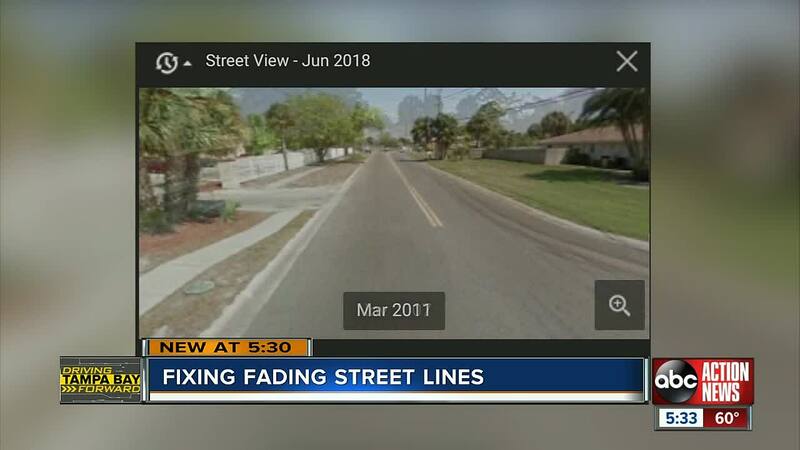 ABC Action News reached out to the city's street department about how long paint on our roads last, and they say it's typically four to five years. As part of our dedication to Driving Tampa Bay Forward, we're looking into different infrastructure needs in the Tampa Bay area that include markings on our roads. The city of St. Petersburg uses the Mayor's Action Center to stay in contact with citizens reporting different needs around the city. The city received a work request on SeeClickFix about a double yellow line that is fading in the Broadwater neighbhorhood off 38th Avenue South. City officials tell us they're constantly painting and re-striping roads within the entire city, but they have a work crew of four people to repaint. The city said they also prioritize the roads by major roads and intersections, then crosswalks and directional lane markings. They will then go into residential neighborhoods depending on requests. However, they add that some residential areas don't like paint markings because it gives a neighborhood too much of an interstate feel. To reach out to the Mayor's Action Center, click here.